As I wrote earlier, some users were seeing yellowish-tinted iPhone 3G screens (above). This included a friend of mine who bought an iPhone 3G (I am, quite sadly, not qualified for an upgrade). There are two components to this issue, apparently. One is that according to Apple, the yellowish-tinge, likened to being “warmer” (if you check out some light bulb boxes sometimes you’ll see a reference to a “warm glow.”), is by design. Also according to Borchers, the first-gen iPhone’s white was more of a cool blue (much like, he said, harsh fluorescent lighting), while the 3G’s is warmer and more of a sunny yellow. At the same time it’s been noted that some of the shipped iPhone 3Gs have an older firmware, 5A345. 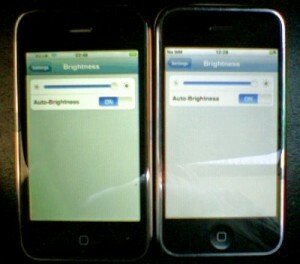 If you update the firmware to 5A347, it appears that the iPhone 3G will have a much less yellowish cast. On your iPhone, go to Settings > General > About. If your firmware is 5A345, do a Restore to get 5A347. The full process takes about half an hour.